Jared Wynn (left) and Tyler Schultz have been awarded Henry C. Gardiner Scholarships for 2013-2014. If the Henry C. Gardiner Scholarships applicants are indicative of the beef industry leadership in the future, we are in good hands. Twenty-one applicants were received and six finalists were interviewed for 2013-2014 scholarships. 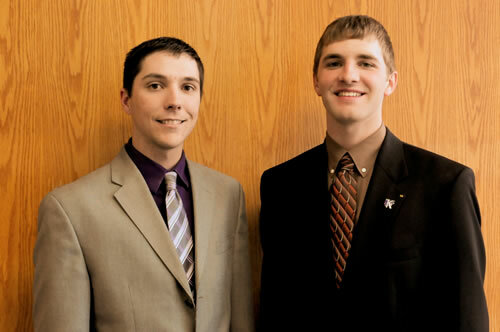 Tyler Schultz, Haviland, Kan., and Jared Wynn, Ashland, Ohio, have been awarded Henry C. Gardiner Scholarships for 2013-2014. Tyler Schultz is a junior majoring in Animal Science with an emphasis in business. Tyler has been actively involved in his family’s registered Hereford operation. He is a member of the K-State livestock judging team and has been a member of the meats judging team. Schultz owns a herd of registered Polled Herefords and is growing his herd through the use of embryo transplant. Jared Wynn is a junior Animal Science major at K-State. He is currently a member of the livestock judging team. Jared is a partner in his family’s Angus operation and upon graduation, plans to return to Ohio and assume the next generation of decision making in his family’s beef operation. All candidates must complete a detailed application. A designated panel conducts interviews with each of the finalists. Applicants are evaluated on academic excellence, work ethic, leadership potential, and attitude. Recipients must express an interest in animal genetics, animal nutrition, animal health, reproductive management, agribusiness management or marketing. The Henry C. Gardiner Scholarship is possible through the generous contributions of Gardiner customers, friends and family in an effort to continue the legacy of Henry Gardiner. Students classified as a rising junior, junior or senior, either enrolled in or planning to enroll at Kansas State University with a major in Animal Science & Industry or closely related field may apply. Scholarships are awarded annually to students meeting rigorous criteria and exhibiting a passion to focus on improving the beef industry. Gardiner Angus Ranch is a family-owned and operated business that produces registered and commercial Angus cattle. The original ranch was homesteaded near Ashland, Kan., in 1885 by Henry Gardiner’s grandfather. The ranch encompasses more than 50,000 acres. The Gardiner operation sells approximately 2,000 bulls and 1,500 registered and commercial females a year. Over 80% of the sale offering each year is the result of embryo transfer. Gardiner Angus Ranch is a founding member of U.S. Premium Beef, the producer-owned limited liability corporation with minority ownership in National Beef, the nation’s fourth largest beef processing company. By providing access to a proven value-added processing system through GAR delivery rights, Gardiner Angus Ranch customers have received more than $4.1 million in premiums and dividends.